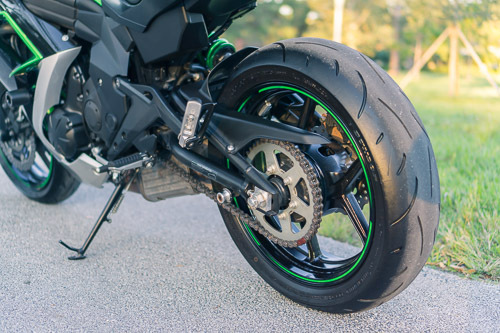 If you’ve stumbled upon this article, I’m guessing you’ve either lost the bolts that came with your swingarm spools or they’ve rusted. Perhaps they’ve started to bend until the point where it looks like they just might break at any moment. 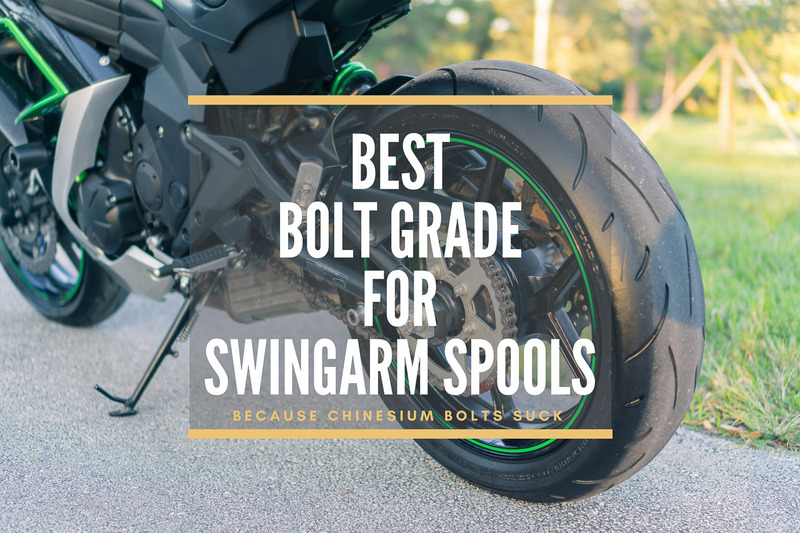 Rather than simply buy whatever is in stock at Home Depot, you actually used that meat between your ears and thought it would be appropriate to look up what’s the best bolt grade for swingarm spools. Good for you! The only problem is that it would seem like almost no one lists the right spec. Thankfully, here I’m gonna tell you what you should be looking for in the right bolt for spools or sliders. What is a bolt’s Grade? The first question to answer is what in the world is a bolt’s “Grade”? Well, bolt grade essentially means how strong a bolt is measured in a variety of different ways. The reason why this matters is because of the potential consequences of using the wrong bolt. Use too weak a bolt, and it might snap simply from putting your bike on a rear stand. Too strong a bolt is less of a concern but, at its extreme, it could lead to damaging the frame or spool mounting thread in a slide. The goal is to find the right compromise. And while this may seem like a petty issue, you’d be surprised about how often people buy a high-end Pit bull Race Stand only to later install cheap chinesium spools with pot metal bolts. The short answer is that you should try to avoid unmarked bolts for which no grade is known or listed. The right bolt would be SAE (American) grade 5, or Metric grade 8.8. That should be the best compromise between strength and flexibility. If you find that grade unavailable, then going with a higher grade would certainly be preferable to a lower grade. For perspective, Yoshimura typically ships their spools with Grade 8.8 bolts. If it’s good enough for them, it’s good enough for us. The only real risk of going with a grade higher than that is that in an accident involving a prolonged slide, it might create issues. If the spool catches on something, instead of breaking it might tear off the welded thread stub or even damage the swingarm. Given how unlikely that is to either happen or make a difference in the likelihood of the bike surviving, it’s a risk I’d be comfortable with. I mention this mainly because you might find that Grade 10.9 or 12.9 Metric bolts are much more widely available, or cheaper, than 8.8. If that’s the case I’d personally go for it. On the other hand we have the risk of going with a no-name, no-grade bolt. This can be a much more significant issue. Especially with the cheap generic spools that Asia so graciously provides. They will rarely if ever come marked, and are frequently soft stainless-steel bolts. In case of doubt, you really should replace them. I’ve frequently seen cheap stainless bolts start bending after going on a rear race stand only a few times. Ask yourself how much it would cost to repair the scratches if your bike fell off the stand because the spool’s bolt snapped. Then tell me that 5$ for a pair of bolts is expensive. Once you start looking for bolts, you’ll notice there are a few different materials and finishes. Normally, given how prone bikes are to corrosion, I’d recommend stainless steel if suitable bolts could be found. But given that they seldom are hardened (part of the “stainless” gig), in this case I’d avoid them. Going with regular steel bolts is going to be preferable, provided you apply a good threadlocker like Loctite 243 (Blue) and then spray it liberally with a quality anti-corrosion lubricant like CRC Heavy Duty Corrosion Inhibitor (It’s particularly suitable here because it leaves behind a protective wax-like coating). Another good option would be to apply Anti-Seize instead of a threadlocker, as it will provide the maximum corrosion resistance. 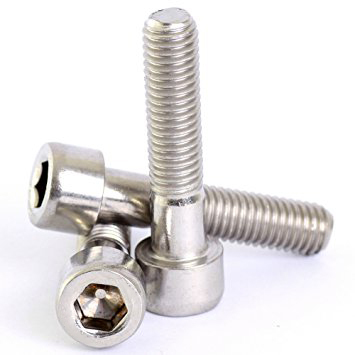 On the finishes topic, galvanized, zinc or nickel-plated bolts are going to give the best resistance against rust. However, they seem to be a bit harder to find for the typical Allen bolts used for spools. Or much more expensive. You’ll most likely find them black-oxide coated, which is okay. Just coat them with oil prior to installation because the surface is slightly porous and will absorb it. If you don’t, rust will shortly follow. If you can find plated, even better. You might find that your local hardware store looks at you weird if you ask for a specific-grade bolt. Regrettably, that’s all too common these days. Don’t expect any better asking at your dealership which is the best bolt grade for swingarm spools. You will be best off simply getting the bolts on Ebay, Aliexpress or Amazon (though you’ll probably find it cheapest on Ebay or Aliexpress). For example, in the case of the Ninja 650 above you could search for “M8 bolt 10.9 30mm” (I found 10.9 much cheaper than 8.8, for better or worse). Just substitute the thread, length, bolt head and grade for whatever you need for your particular application. If you are looking for some replacement bolts for frame sliders instead of spools, all the previous details still apply. And finally, on the installation front, if you’ve got this far you might as well go the full mile. 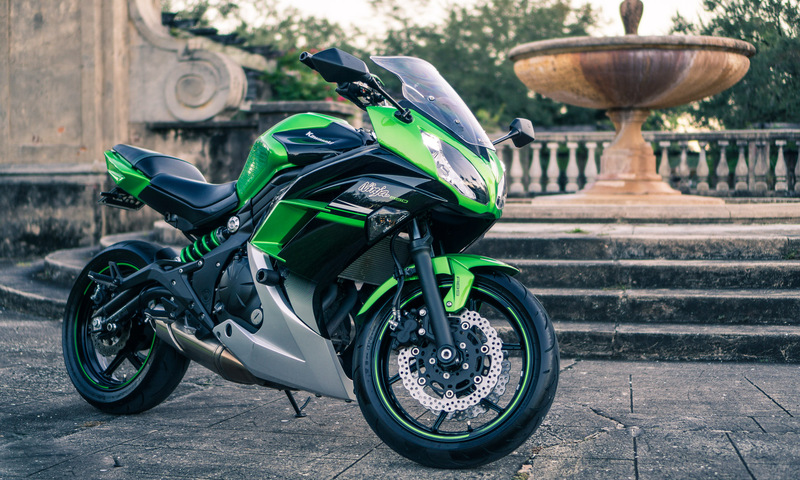 A good general value for swingarm spool torque would be 9.5 ft-lbs / 13 N-m (for an M8 bolt). 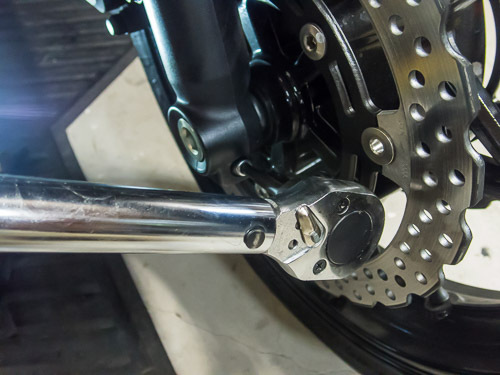 If you have a Torque Wrench available (and you should! ), torque it down right. All in all, I know that the best bolt grade for swingarm spools isn’t a typical question. Nonetheless, it’s nice to know you’re doing things right. If you have any more questions, or suggestions of your own, feel free to contact me or leave them in the comments below.